What’s the world’s best monument featuring a rotating dictator? Is it the Arch of Neutrality in Turkmenistan? Of course it is! The Arch of Neutrality was commissioned by longtime Turkmen leader Saparmurat Niyazov. After the split-up of the Soviet Union, Niyazov became president and zany dictator of Turkmenistan. He proclaimed himself “Turkmenbashi” or Father of All Turkmen. He renamed the months of the year after himself and his mother. The Ruhnama, his autobiography, became required reading in schools. Gold statues of him popped up all around the country. Opposition was crushed. Human rights violations were racked up. It was a real old-fashioned personality cult. This Atlas Obscura entry lists some of Niyazov’s whimsical laws, including the banning of opera, ballet, circuses, and the use of make-up by television presenters. Late in his reign, he decreed men shouldn’t have beards or long hair. He outlawed smoking in public after heart surgery forced him to quit the habit. And this BBC article discusses his stern condemnation of gold teeth (popular in Turkmenistan) as a dental care option, advocating instead the chewing of bones. Direct quote: “I watched young dogs when I was young. They were given bones to gnaw. Those of you whose teeth have fallen out did not gnaw on bones. That is my advice.” And his advice, of course, was effectively law. But the Arch of Neutrality — a monument to the country’s policy of neutrality toward its neighbours — was a real crowning achievement. Over 75m tall and shaped like a rocket ship, this monument stood in the centre of Ashgabat, the capital, for over a decade. It was erected in 1998, coming in at a cost of about $12 million. A big chunk of that cost was surely the 12m tall gold statue of Niyazov himself standing on the very top of the monument, his arms held open and aloft. The statue rotated slowly over the course of the day, so that the great Father of All Turkmen would always face the sun. Splendid. 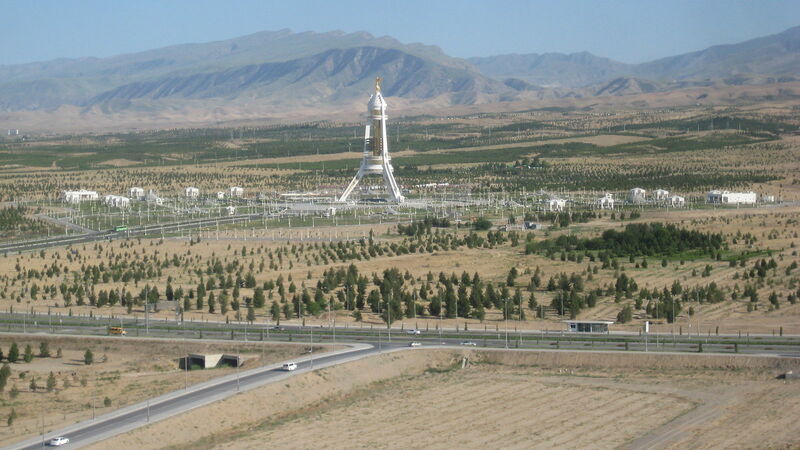 The statue of Turkmenbashi was set back atop this new monument, but the old leader doesn’t rotate anymore. He just stands there, very still, letting the sun hit his face at less direct angles. Poor guy. What a humbling.